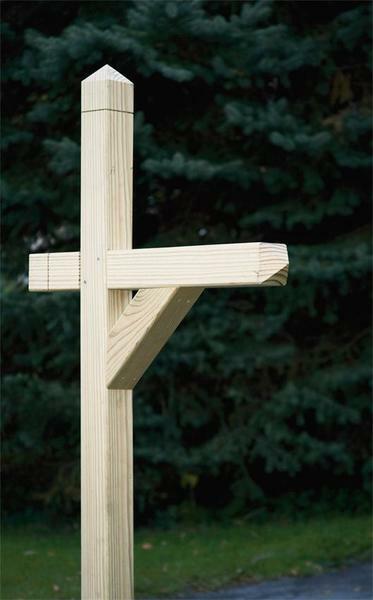 Perfect for any home or business, this Amish made mailbox post is made of unfinished environmentally friendly pressure-treated pine and stainless steel screws to stand up to years of outdoor use. The solid wood mailbox post edges have been smoothed and rounded to eliminate splinters. This mail box post is built by Amish woodworkers with a careful attention to detail and a commitment that reflects time-honored traditions of integrity, simplicity and hard work. Order this to go with your own mailbox or choose order one of our Amish made mailboxes to complete the look. Height from Arm to Top: 16"
Post size: 4" x 4"
Note this product qualifies as a "Green Product". It has earned the respect of Good Housekeeping and the GreenSpec list.